Before you practice traditional Yang Style Taijiquan, you should first learn some important fundamental practices. These practices will help you understand the essence and the root of taijiquan practice. 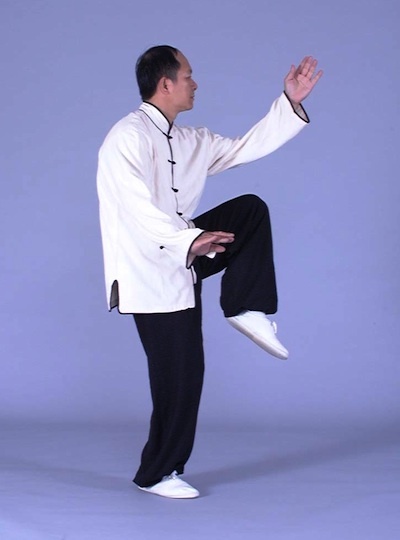 I will first introduce the most basic training in taijiquan—the fundamental stances. From these stances, you will build a firm physical foundation of taijiquan postures, which are the building blocks for the movements. After introducing the fundamental stances, the entire primary taiji qigong set can be better understood. This qigong helps a taijiquan beginner grasp the keys to using the mind to lead the qi and to coordinating the mind, breathing, and movements. After learning this basic qigong training, the next step is moving taiji qigong. This moving qigong will give you the feeling of the taijiquan movements. This feeling is the harmonization of your mind, body, breathing, and qi. Moreover, the higher level, Coiling Taiji Qigong Set will not be discussed here. If you are interested in knowing more about taiji qigong practice, you should refer to the book The Essence of Taiji Qigong, published by YMAA. Taijiquan, like other martial arts has its own fundamental stances that are the basis for stability, movement, and martial technique. Basically, taijiquan uses eight stances (ba shi), each of which is used during the bare hand sequence. Described below are the eight stances. When you practice these stances, you may ignore the positioning of the hands until you begin the sequence. The horse stance is commonly used as a transition between techniques and forms. To assume this stance, first place the feet parallel, slightly beyond shoulder width. Next, bend the knees until the angle between the rear thighs and calves is about 90 degrees. The torso is upright, natural, centered, and relaxed. The knees line up with the toes. Both feet must remain flat. It is important to understand that in order to avoid strain to the sides of the knees that can lead to injury, the knees must always line up with toes during your practice. 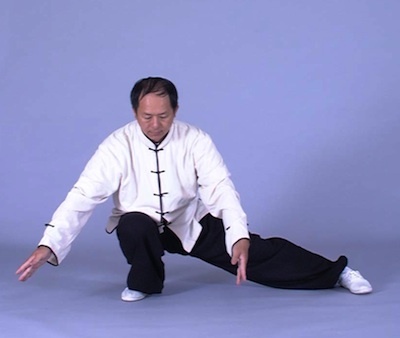 This important form, the mountain climbing stance or bow arrow stance, is the most commonly used offensive stance in taijiquan. First, place one leg forward so that the knee and toes are lined up perpendicularly and the leg as a whole supports 60 percent of the body's weight. The toe of the lead leg is pointing 15 degrees to the inside. The rear leg is firmly set down while supporting the rest of the weight. The knee of the rear leg must be slightly bent in this stance. Keep the upper body perpendicular to the ground. Again, beware of knee injury, and keep the knees lined up with the toes. Second, turn the body and the right foot with heel 90 degrees clockwise while pivoting on the left toe. The same can be done with the left side: turn the body and the left foot with heel 90 degrees counterclockwise, and pivot on the right6 foot on the toes. 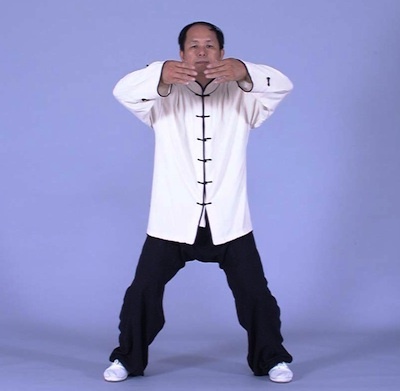 The four-six stance is the most commonly used defensive stance in taijiquan. In weight distribution, it is exactly the opposite of mountain climbing stance; the front leg supports 40 percent of the weight and the rear leg supports 60 percent. The rear leg is bent, with the knee and toes turned inward, while the front leg is held loose, slightly bent, and relaxed. Tame the tiger stance is used for low attacks and defense. To assume this stance, stand with both feet spread. Next, squat down on one leg while keeping the other leg straight. The thigh of the squatting leg must be parallel to the ground and both feet must be flat. Again, the knee of the squatting leg should line up with the toes. The false stance is used to set up kicks. First, place all your weight on one leg. Next, set the other leg in front of the body with only its toes lightly touching the ground. From this position the false leg can kick without hesitation. The golden rooster standing on one leg stance is similar in form to false stance and serves the same function: to set up kicks. To assume this stance lift either knee up with the toe pointing 45 degrees down (i.e., the ankle is relaxed naturally). The raised leg can kick at any instant. The squat stance is primarily used as a training device to build up the knees. To begin, stand with feet spread shoulder width apart. Squat down until the thighs are parallel to the ground and the back is straight. You should attempt to stay in this stance for five minutes while keeping the mind calm. In order to guard against injury, you should start at first with only one minute, and then gradually increase the time.